Doing primarily electronic music, synthesizers are the basis for the sound of Antilles. 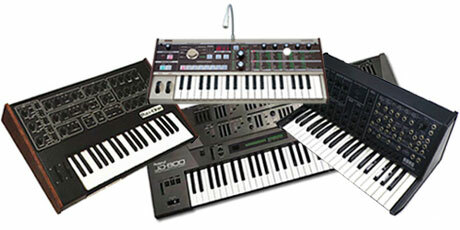 Both classic analog and modern digital synthesizers are used. This page features information, reviews, audio samples and pictures of the synthesizers used by Antilles. I don�t much like working with softsynths. It�s not that they don�t sound good enough; they just don�t inspire me like working with real hardware synthesizers. I find analog synthesizers much more interesting. Besides the superior sound, I think that the limitations of analog synthesizers add to the musical creativity. In the synthesizer reviews I use terms such as ‘envelopes’, ‘LFO’, ‘waveforms’ ect. If you’re confused visit the Vintage Synths Glossary of synthesizer terms.